Did you know that Florida is one of the most dangerous places in the country when it comes to deadly crashes involving pedestrians, cyclists, and motor vehicles? A study conducted by Smart Growth America found that Tampa Bay ranked #7 on the Pedestrian Danger Index. Even more concerning is that three roads in Tampa Bay are the deadliest in the entire state. A report published by the National Highway Traffic Safety Administration indicated that over a ten-year period, from 2007 to 2016, Florida had one of the most significant increases in fatalities and alcohol-impaired driving fatalities. In 2016 alone, more than 3,100 lives were lost because of crashes. Unfortunately, that trend is likely to continue to grow. When you’re driving in your car or walking on the sidewalk, your surroundings and circumstances can change in a second. Every person using the road needs to practice more vigilance and adopt better practices for being safe on our roads. 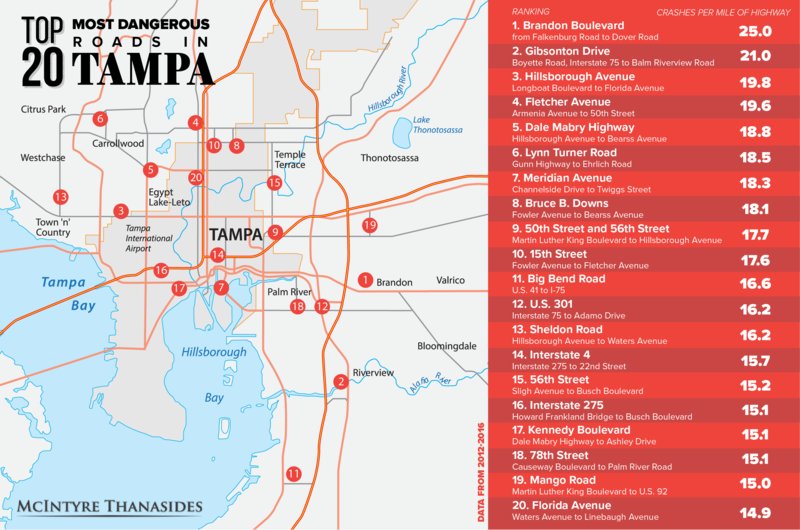 Here is a map of the top 20 most dangerous stretches of roadway in Tampa. If you have been hurt in a car crash, either as a pedestrian, cyclist, or motorist, contact a personal injury attorney immediately to evaluate your case and make sure your rights are protected. You have a right to be compensated for your injuries, and an attorney can help you fight the insurance companies to get a favorable outcome. To learn more about what to do if you have been in an accident, contact the law firm of McIntyre Thanasides Bringgold Elliott Grimaldi Guito & Matthews, P.A at 844-511-4800.